What Happened covers what she had for breakfast, her favorite snacks and dessert, and other details about how the former First Lady fueled up during her historic bid for the White House. This week, Hillary Clinton released her much-anticipated book What Happened ($18, amazon.com), and the internet's been buzzing ever since about her behind-the-scenes take on her doomed 2016 presidential campaign. But here's what caught our eye: Clinton's account of what she ate during those grueling months on the campaign trail. Turns out she loves food as much as the next person and fueled up with a variety of totally delicious meals and snacks. "It's funny how much you look forward to the next meal when you're living out of a suitcase," Clinton wrote. Here's what the former first lady relied on for breakfast, lunch, dinner, and at snack time (yep, she mostly stuck to the same favorites) as she rallied supporters and gave speeches while on the road for nearly 600 days. After waking up and checking her email, Clinton would order her morning meal from room service, unless she was at her home in upstate New York during a rare break from campaigning. Either way, her breakfast remained the same, she noted: "Usually I opt for scrambled egg whites with vegetables." If they were available, she liked to add fresh jalapeños or salsa and hot sauce to spice up her lean protein and veggies. While reading press clips, Clinton would wash it down with black coffee or strong black tea, plus a "huge glass of water." One of the flight attendants on Clinton's campaign plane, a nutritionist named Liz, regularly brought fresh, home-cooked meals aboard for the entire staff to enjoy. Salmon salad, chicken tenders made with almond flour, and poblano pepper soup were notably tasty, wrote Clinton. There was dessert, too: "Her surprise smash hit was brownies made out of chickpea flour." After the less-than-healthy diet she consumed during her 2008 bid for the presidency, Clinton committed to eating nutritiously this time around. Reserve supplies of canned salmon, Quest bars, and KIND bars boarded the plane with her staff. "When the Quest bars got cold, they were too hard to eat, so we sat on them for a few minutes to warm them up, with as much dignity as one can muster at such a moment," she said of the protein bars that helped energize her as she crisscrossed the nation. Clinton's weakness? Goldfish crackers. "[I] was delighted to find out that 55 goldfish were only 150 calories—not bad!" Liz also introduced her to Flavor Blasted Goldfish during the campaign. Clinton said her staff passed around a bag, debating whether this flavor trumped the original. She didn't limit the spicy stuff to her morning eggs. Clinton said she first fell in love with the fiery condiment in 1992 and swore it boosted her immune system. She discovered her favorite brand, Marie Sharp's, when her videographer brought a bottle back from a trip to Belize. She's also a fan of Ninja Squirrel Sriracha. 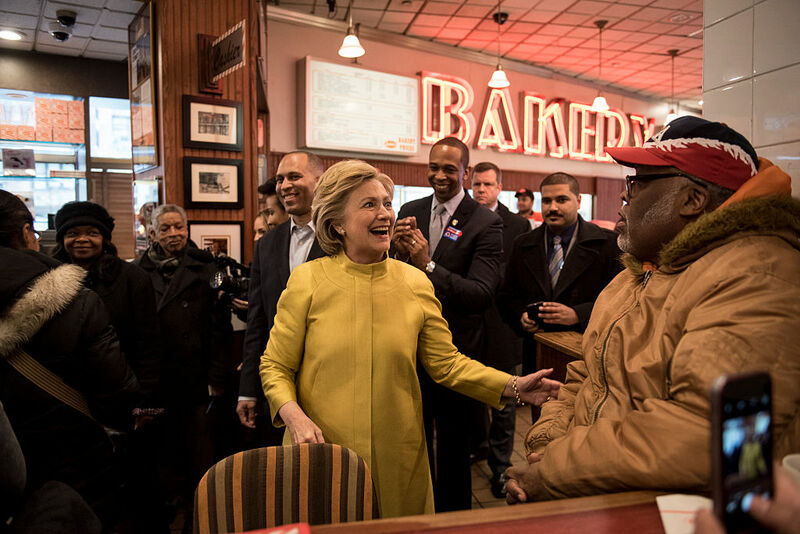 As she traveled the country, Clinton and her staff tried all kinds of cuisine, from Middle Eastern takeout in Detroit to honey and lavender lattes in Des Moines. "At the Iowa State Fair, in the 100-degree August heat, I drank about a gallon of lemonade," Clinton recalled. She also ate a pork chop on a stick, another indulgent state-fair food. During one meeting with Planned Parenthood President Cecile Richards in Cedar Rapids, Iowa, Clinton ordered a martini with olives and Tito's Handmade Vodka. These days whenever she visits the restaurant, the wait staff brings her the exact same martini before she even asks. Besides adorning her campaign plane with holiday decorations, Clinton wrote that cakes were always readily available for staff birthdays. On her birthday in 2016 she found herself in Miami, and she celebrated her birthday there with a chocolate cake with turquoise frosting. This story originally appeared on Health.com.